PhD in Geotechnical Engineering from National Institute of Technology, Rourkela. (Submitted). M.Tech in Geotechnical Engineering from National Institute of Technology, Rourkela, Odisha. BE in Civil Engineering from Biju Patnaik University of Technology, Odisha. OP Jindal University, Raigarh (C.G), Working as a Assistant Professor from June 2018 to till date. 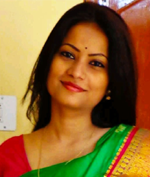 Worked as a Assistant Professor in Centurion University, Odisha from July 2012 to Feb 2014. Mining, Industrial waste utilization, Sustainable construction. Mahamaya, M. and Das, S. K. (2017). “Biopolymer Stabilization of Fly ash and Coal Mine Overburden for Erosion Resistance.,” Chapter 11, Biopolymers: Structure, Performance and Applications, Nova Publisher, USA, ISBN: 978-1-53611-885-8. A corrosion resistant cementitious material from industrial waste, Inventors: Sarat Kumar Das, Lasyamayee Garanayak, Mahasakti Mahamaya, Patent Appl No. 201731017301/Kol Dt 17.05.2017. Mahamaya. M. and Das, S. K. (2017). “Characterization of Mine Overburden and Fly Ash as a Stabilized Pavement Material.,” Particulate Science and Technology, Vol 35(6), 660-666. doi: 10.1080/02726351.2016.1194344 . Mahamaya. M. and Das, S. K. (2018) Characterization of Ferrochrome Slag as a Controlled Low Strength Structural Fill Material, International Journal of Geotechnical Engineering, doi:10.1080/19386362.2018.1448527. Suman,S., Mahamaya. M. and Das, S. K. (2016). “Prediction of Maximum Dry Density and Unconfined Compressive Strength of Cement Stabilised Soil Using Artificial Intelligence Techniques.,” Int. J. of Geosynth. and Ground Eng.2:11. doi 10.1007/s40891-016-0051-9. Das, S. K., Priyadarshini, S. and Mahamaya. M. (2016) “Characterization and design of coal-reject as a Highway Pavement Material.,” Indian Highways. Vol. 44 (4), pp 17-21. Mahamaya, M., Das, S. K. and Bhuyan, P.K. (2018). “Characterization of ferrochrome slag as a controlled low strength material.” Compendium of Annual Meeting Transportation research board, Washington, USA. Mahamaya, M., Suman, S., Anand, A. and Das, S. K. (2015). “Prediction of UCS and CBR Values of Cement Stabilized Mine Overburden and Fly Ash Mixture.,” Procedia Earth and Planetary Science. Elsevier, 11,294 – 302. Mahamaya, M., Mishra,P.N., Suman.S. and Das, S. K.(2015).”Estimation of Thermal Migration Around Buried Coolant Ducts with Engineered Backfill Material.,” Procedia Earth and Planetary Science, Elsevier, 11, 410 – 417. Das, S. K., Mahamaya, M., Panda, I. and Swain, K. (2015). “Stabilization of Pond Ash Using Biopolymer.,” Procedia Earth and Planetary Science., Elsevier, 11,254 – 259. Swain,K. Mahamaya, M., Alam, S,and Das, S.K. (2017) Stabilization of Dispersive Soil Using Biopolymer. Sustainable Civil Infrastructures book series, Springer, pp 132- 147. Parhi, P.S., Garanayak.L., Mahamaya, M. and Das, S. K. (2017). “Stabilization Of An Expansive Soil Using Alkali Activated Fly Ash Base Geopolymer., Sustainable Civil Infrastructures book series, Springer,. DOI 10.1007/978-3-319-61931-6_4. Academic excellence Award for securing 3rd Position in M. Tech (Geotechnical Engg.) for the academic session 2010-2011, in the occasion of Institution day celebration at NIT, Rourkela. Institution Award for Best Paper, “Characterization of Controlled Low Strength Material using Fly ash and mine overburden”. Institution of Engineers (India), Odisha Chapter. 2017 Civil Engineering. Muralidhar Satapathy Award for Best Paper, “Dispersive soil and its stabilization using Biopolymer for Environmental Control” Institution of Engineers (India), Odisha Chapter, 2018 Civil Engineering.